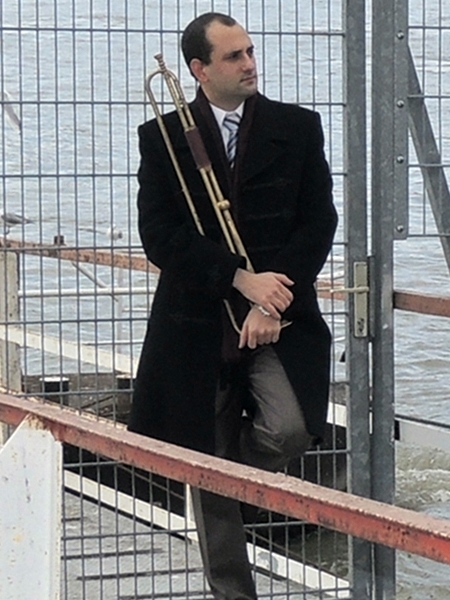 Gabor Hegyi starts to play the trumpet in his hometown Budapest at the age of 6 years. With 14 he attends the Béla Bartók academic high school of Budapest. At the age of 19 he decides to continue his musical education in Germany at the University of music in Trossingen. His subjects will be „university graduated music teacher and –musician”, he graduates both subjects with honors. Thanks to his professor Horst-Dieter Bolz he comes in contact with the barock trumpet at an early stage. This extraordinary experience Gabor is the beginning of Gabors barock trumpet career: he decides to dedicate himself completely to the barock trumpet and the historical performing. As a consequence of this he continues his studies at the Royal Conservatory in the Hague under the special training of Prof. Susan Williams. Thanks to the fantastic and fertile cooperation and instruction of Prof. Williams Gabor manages to become established in the world of early music. From this time on Gabor will be engaged in the best ensembles such as The Bach Ensemble, Concerto con Anima, Concert Royal Köln, Elbipolis Barockorchester Hamburg, La Stagione Frankfurt, Akademie für Alte Musik Berlin, or Concerto Köln. Apart from these Gabor could prove his talent at various state operad such as the „Südwestdeutsche Philharmonie Konstanz”, „Opera d´Lausanne” or the „Staatsoper Stuttgart”. As a chamber musician and solo player he performed already in many different countries such as Argentina, Alger, Germany,Holland, France, Italy, Poland, Portugal, Rumania, Switzerland, Tunisia and Hungary. Last but not least he regularly takes part in TV and radio recordings in Europe, North Africa and South America. Gabor&apos;s world premiere recording of "J.W. Hertel Concerto à cinque D-Dur für Trompete, zwei Oboen und zwei Fagotte" with the "Concert Royal Köln Ensemble" has won the ECHO Klassik 2015 prize in the category of 17-18. century wind chamber music.